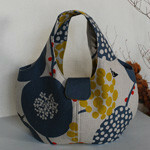 The featured project is a mini Boston bag made with a simple unisex design fabric, the ni-co collection from echino. 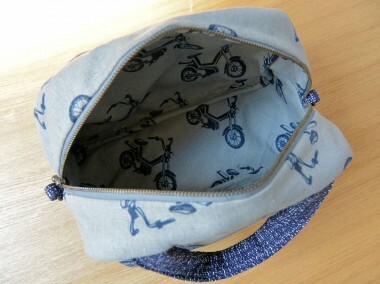 With a strap, it can also be used as a shoulder bag. 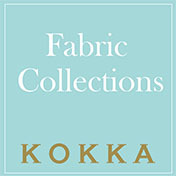 A contrasting material to a cotton linen, a tweed fabric is specifically matched as an accent. An outside slit-style pocket can fit a smart phone. 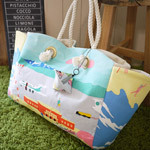 While the size is small, the bag is filled with such user-friendly ideas. 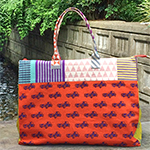 The masculine look of the automobile design may remind of you of an item for a boy, but I ventured to make something with a feminine shape. 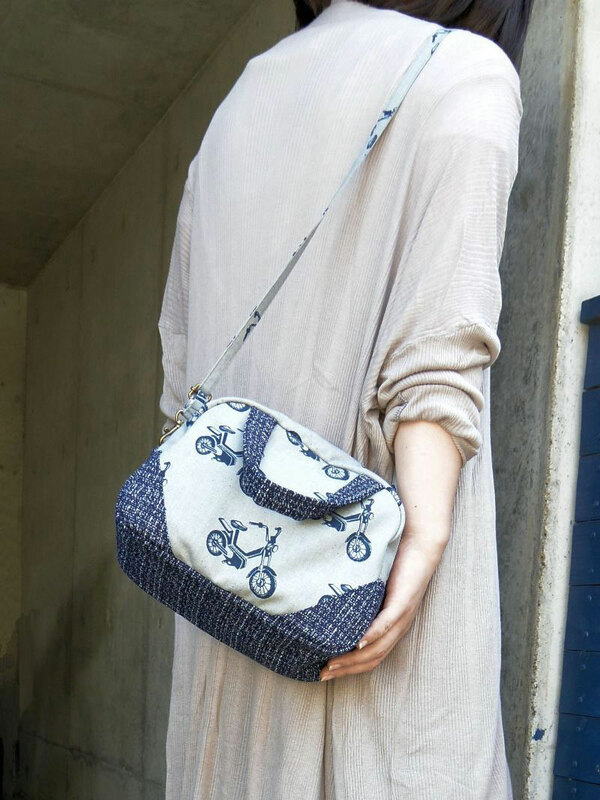 By combining it with a contrasting material, tweed, it turned out to be a playful bag suitable for mature women. 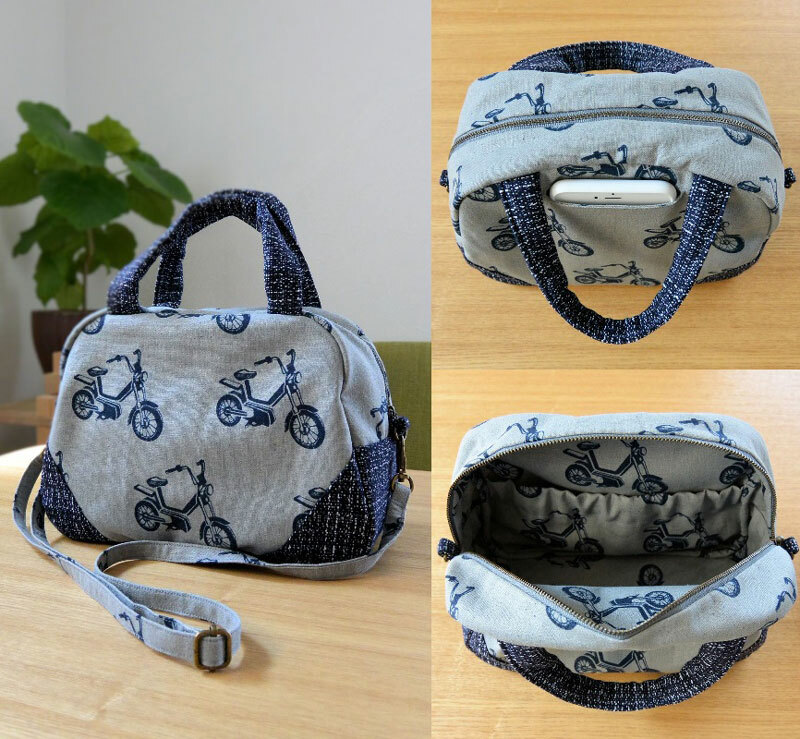 The cotton canvas fabric is easy to handle, so I included many parts to construct this bag. The outer slit pocket is for a smart phone including the ones with a large screen. 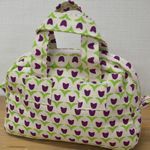 The bag itself is big enough to fit a large wallet and can hold a lot with an ample bottom gusset. 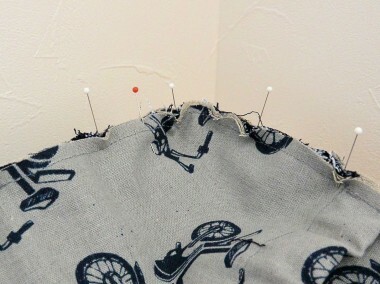 Please use a #14 needle for machine sewing. 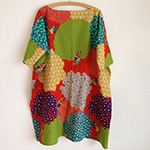 With many layers of fabric added as the process progresses, you may want to replace the needle to prepare. 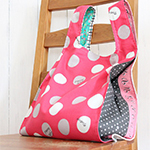 The seam is treated with a piping, so the bag is solid and self-standing without adhering a backing. For this fall, the voluminous style is still in vogue, so a mini Boston shoulder bag will be a great accompaniment for this look. 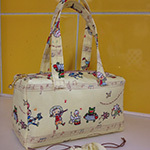 Since the bag is small, it will look so cute when a little child carries it. Slit pocket is somewhat unusual for small fabric goods, but please try it. It is not too difficult as this project only requires opening a slit. If you find it challenging, it is ok to skip this process. 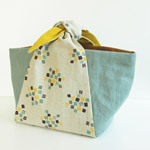 The bag consists of many parts, but each piece simply requires a straight stitching. Just like building a plastic model car, those who can “construct” something will find this project fun. When you finally put all parts together, the bottom corners will be slightly gathered to create a fluffy look. 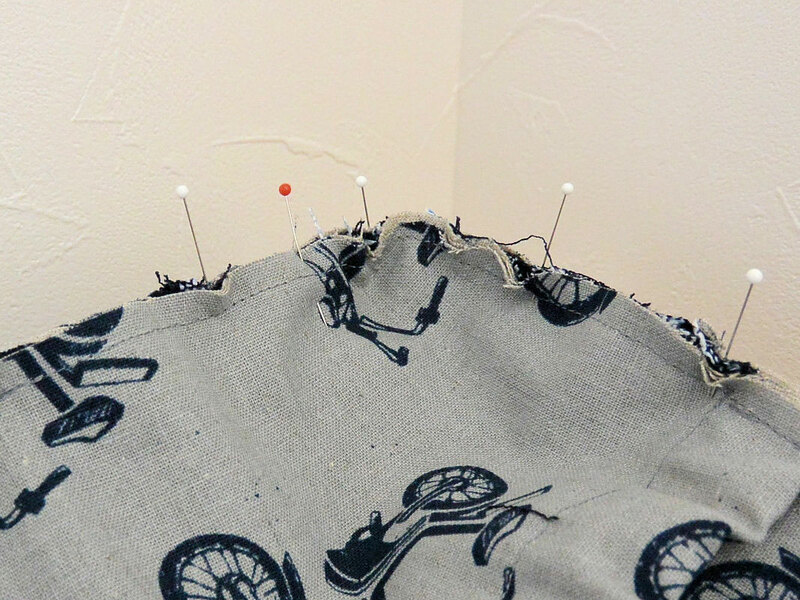 Use many pins or run rough stitches and pull the thread to gather if you are not accustomed to this process. When putting together the gusset and bag, I also sew the bias binding strip together. You may think handling each piece may be better, but sewing them altogether will lead to a clean finish. The two outer stitch lines were sewn altogether. 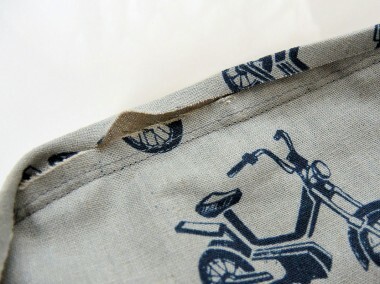 Using these stitch lines as a guide, you apply the bias binding strip. 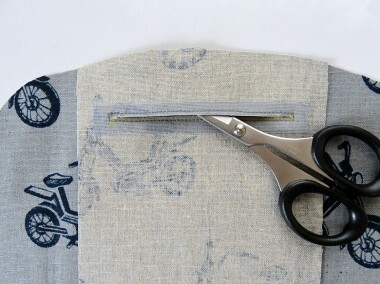 To focus on a clean finish, the bias binding strip is 4cm-wide to a 1cm seam, requiring you to stretch the piece as you attach it. If you find the process difficult, you may make the seam to about 7mm. 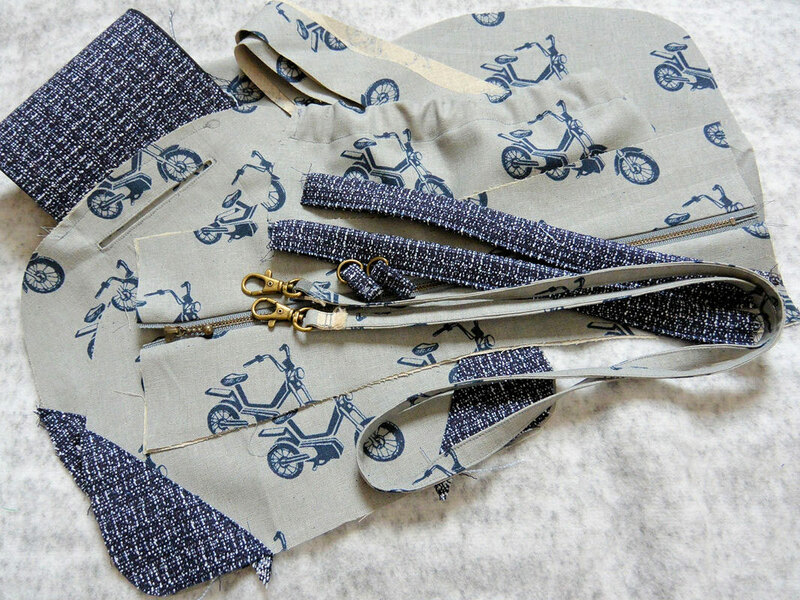 Align the shape by pressing the bias strip covered seam to the gusset side. Finished!